In real estate and architecture, some dreams need a lot of staying power to get realized. The Seagram Building is the realization, some three decades late, of Mies van der Rohe's dream of a glass-covered, high rise office tower that would provide a stunning monument to the International Style's faith in simplicity and clarity. It was worth waiting for as the 38-story tower quickly began the country's most influential and copied office building, an instant classic. Its almost mythic greatness lies in the tower's proportions, the fineness of its bronze and dark-tinted glass curtain walls, and its expansive front plaza. Yet its much heralded plaza, which led the city to rewrite much of its office district zoning in 1961 to encourage similar open public spaces in new projects, is not really appropriate or necessary on as broad a landscaped boulevard as Park Avenue. Furthermore, it followed by six years the lead of Lever House (see The City Review article), catty-corner across the avenue at 53rd Street, in introducing a slick glass curtain wall and public open space. Of course, Lever House is green and its open space is tucked beneath its arcade and the building's base that fills its property line as opposed to Seagram's rather golden hue and large open plaza. One could argue ad infinitum over the merits of different colors in the urban environment and the decades since the completion of the Seagram Building have certainly not settled debates over the merits of plazas. To have both buildings, which total transformed the uniform nature of Park Avenue in the 40's and the 50's, was a remarkable coincidence in an era that cared little for contextual design. Interestingly, Lever House is immediately surrounded by more derivative buildings, at least in terms of glass tint, than the Seagram Building, although that is proof of very little in the argument/contest/contrast between the two great buildings. The Seagram Building was designed in an age that also did not pay much heed to the needs of the disabled and the plaza and the building's side entrances are raised several steps from the sidewalk. Although the plaza has no formal seating, its low, dark green, polished granite north and south walls along the sidestreets that gently slope down towards Lexington Avenue are Park Avenue's most popular seating areas in good weather. (Of course, there are not many public seating areas on the avenue although in its early years it had serpentine walkways with seating in its much broader median in the 40's and 50's.) If that broad, landscaped mall had survived, the Seagram plaza would really have been unnecessary and the avenue and the city better off (as long as they still built the project elsewhere in Manhattan). The plaza has two rectangular reflecting pools at its north and south ends that are filled with forests of Christmas trees during the holiday seasons. For many years, a large Henry Moore sculpture was placed off-center, and very effectively, in the plaza and then replaced with other sculptures that changed and often the plaza is barren. With more than 800,000 square feet of office space, the Seagram Building, which originally was going to be called Seagram House, is not petite. By setting back its tower, whose front facade rises without setbacks, so far on the site to create the plaza, the building sacrificed considerable rental space under the zoning then in effect. In 1976, the building's owners requested designation of its exterior as an official city landmark, an extremely rare action as most commercial property owners were, and still are mostly, very wary of design reviews and potential higher preservation costs associated with such landmark designations. The city's laws do not permit landmark designations for buildings less than 30 years old. That restriction resulted in the unfortunate abuse of many fine commercial properties. The city only created its Landmarks Preservation Commission in 1965 and many preservationists were greatly, though not publicly, concerned that major landlords might legally challenge the city's new landmark regulations and also argued that buildings should stand the test of time before being designated. In 1980, the building, still undesignated, was sold to the Teachers Insurance and Annuity Association of America, a huge pension fund long active in real estate, with the proviso that it apply for landmark designation for the property when it became eligible in 1988. By 1988, many city preservationists felt that not only should the Seagram's exterior be designated, but also the interior of the Four Seasons Restaurant. The building owners strongly opposed the interior designation on the grounds that restaurants tend to have shorter life cycles than buildings and designation would inhibit future users of the space and possibly create economic hardships for them. The restaurant, whose entrance is on 52nd Street, was designed by Philip Johnson, who became a regular patron, and its very handsome design and celebrity as one of the city's most expensive restaurants, added significantly to the allure of the Seagram Building as it occupies, with total discretion, all of its retail frontage facing the avenue. As a result, the building seemed more institutional than speculative and commercial. Its entrance is a large, travertine-walled and -floored lobby with coatroom and a broad staircase leading to its south dining room and bar in the south base wing of the building. The upper walls of the spacious, double-height room are covered with French walnut panels of extravagantly high quality. A dining balcony is at the east end with a private dining room behind it. The room is highlighted by a very dense brass Richard Lippold sculpture that "floats" over the bar. The restaurant stretches to the north base wing of the building through a broad, high corridor adorned with a very large theatrical hanging backdrop for the ballet, "The Three-Cornered Hat," by Pablo Picasso, that is rather muted with a narrow range of colors and not one of the artist's better works, but impressive, nevertheless. The north dining room has a large square pool at its center and is brighter and has more landscaping than the south dining room. The large windows in both rooms are hung with fluttery, floor-to-ceiling draped chain curtains that accent the glistening water of the pool and the glitter of the Lippold sculpture. In typical New York reverse snobbery, the south dining room is frequented by more celebrities than the more attractive north dining room. Since patrons must pass through the south wing to get to the north dining room, the rationale, among power lookers, is that by sitting in the former you get to see everyone in the restaurant if you stay long enough. The restaurant has always been one of the city's most expensive and highly rated and in keeping with its name it changes its menus seasonally. Mark Rothko, the Abstract Expressionist painter, had been commissioned to design murals for the restaurant, but decided not to complete the project because he felt it was not an appropriate setting for his art, strangely. Tucked away in the basement, with an entrance on 53rd Street, is the large Brasserie Restaurant, whose main claim to fame is that it stays open 24 four hours a day. Much less expensive than its luxurious neighbor, the Brasserie offers patrons one of the best entrances in the city down a small flight of stairs from which one can survey almost the entire, brightly-lit restaurant, which is decorated with many Picasso plates. Purists point to the facade's excellent detailing and bronze mullions and spandrels, but the building's real strength lies in the serene sense of strength and orderliness that its sheer facade and tall tinted windows convey, an effect augmented by the fact that the facade is not interrupted by any "mechanical" floors that contain the building's heating, ventilating and air-conditioning (HVAC) equipment. This is more a conservative than a cool corporate environment, energized by the warmth of its bronze color and the rhythmic repetitive pattern of its fenestration. Like a well-bred lady who is confident enough not to wear the emperor's new clothes, the Seagram Building has a sophisticated arrogance that can wilt trendy fashions with the authority of its posture and demeanor. Interestingly, the building's form is not as simple as the Park Avenue facade might indicate as the central portion of the east facade protrudes considerably from the slab. 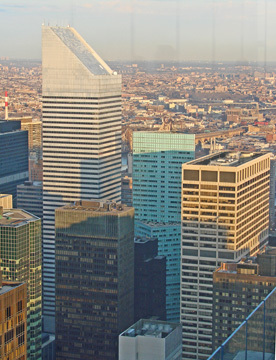 In early 2006, the city's Landmarks Preservation Commission approved a plan by Aby Rosen, the owner of the Seagram Building, to transfer the unused air rights from the Seagram Building to the site behind it on 53rd Street to build a hotel and residential condominium tower designed by Sir Norman Foster on the southwest corner at Lexington Avenue. The new tower will be very slim and about 700 feet tall.